Over the past year the Thai Index has soared 180 %. By comparison, the combined Purchasing Intent Index for the five most popular countries with Chinese buyers in the second quarter of 2015 (the US, Australia, the UK, Canada, New Zealand) rose just 37 %. On a quarterly basis, the Thai Purchasing Intent Index is up 51 %, much better than the 1 % drop in the top five countries average. 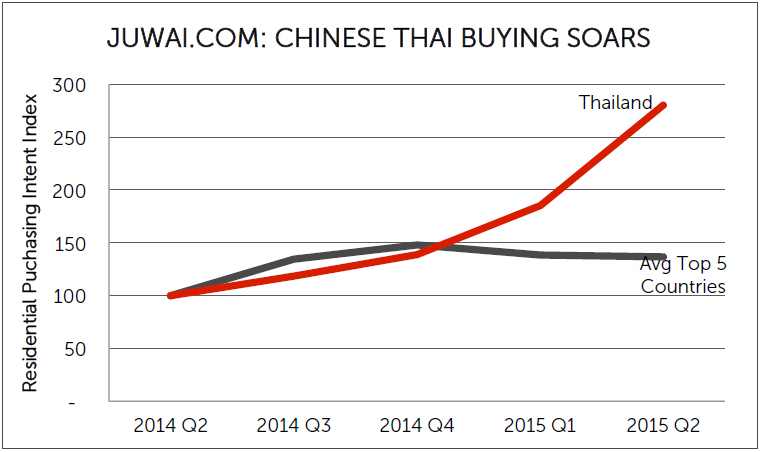 The average price Chinese buyers inquire about in Thailand has also increased substantially, by 39 % over the prior quarter and by 111 % over the prior year, to a new high of $611,062. 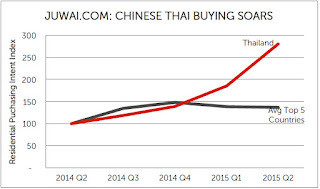 Juwai.com CEO Andrew Taylor says, "Chinese buyers are taking advantage of their strong currency and proximity to Thailand to invest in vacation homes and investment properties. Over the past five years, the Renminbi has gained 19 % on the Baht. "Chinese businessmen with commercial interests in Thailand were among the first buyers of local residential real estate. Now, you see vacationers and investors joining their ranks. "The top destinations in Thailand are Pattaya, Koh Samui, Phuket, Chiang Mai and Bangkok. "Thailand could greatly profit from the projected massive increase of Chinese international property investment in the coming decade. It could easily displace other countries that are currently more popular with Chinese buyers. "In this period, Thailand has advanced from the 10th most popular country with Chinese buyers to the 9th."